owls about that then! : Owls owls everywhere! Sunday was spent slogging around more old Little Owl sites checking for residential occupancy, I was in the Wistow & Fleckney area and it was a bag of mixed results. The first couple of sites I checked out offered nothing at all, a bit worrying really as they both had breeding owls at them last year. The third site I visited is a relatively new site for me, No 219. I first recorded owls here back on November 28th 2012. At the time I wasn't sure if they were just dispersing juveniles moving on to pastures new, but I needn't have worried as they were both still there although they did take some finding? I parked up on the private track that runs up to the farm house, it was here right next to the orchard that I saw the owls on my last visit. The weather wasn't too bad and it allowed me to sit quietly in the car with all the windows open whilst reading the newspaper. The first signs that they were still around came when I heard the typical low droaning call of one of the birds, just like last time it was coming from the orchard. The newspaper was soon discarded and replaced with my binoculars. It then took quite some time before I got my first sighting, and that wasn't surprising concidering how deep in the foliage it was! 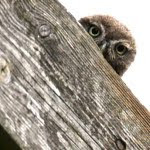 LO site No 219 - hiding owl. It was a bit of a surprise when it took flight and flew straight at me and then landed in the suspect nest tree that I was parked next to. This offered a much closer view and an improved photo opportunity. What I didn't realise at the time is this owl has a damaged left eye, it was much darker yellow and very bloodshot. Although I only managed to photograph one of the owls I did see a pair here, bodes well for the breeding season. Could be a good site to erect a box, mmmmmm we'll have to see? I didn't spend too much longer with them once I realised they were still around and off I went in search of more owls. The next four sites I visited resulted in two complete blanks and two sites with single birds, they will all have to be re-visited again! But the best news came when I was checking out the owls at my site No 184 in Kilby, I'd heard a single owl call here but didn't see it. Whilst I was scanning the general area I noticed that the lane that led off to my right was more than just a dead end and ran on for further than I realised, this needed further investigation! And it was right at the end of the lane when I was turning around that this chap (below) was spotted sitting in a roadside Ash Tree. I can't say that I'd missed him previously as I'd never been down there before! Only the single bird was seen but never the less, get in there new site No 221. The image is a poor one but needless to say I will return in an attempt to improve upon it and to see if there is a pair. The final site that I visited was a three pronged attack really, firstly I wanted to see if the Little Owls at my site No 91 were still around and using one of my nest boxes. The second was to see if any Barn Owls were about, I use to see them here on a regular basis but not since 2011. And thirdly this is the site that I had my best ever encounter with a wintering Long Eared Owl! Whilst waiting the land owner and his wife drove past and stopped for a quick chat, they informed me that they had good views of a solitary Barn Owl just before Christmas, but nothing since? Eventually I had to give up as it got too dark to see, sadly no Barn or Long Eared Owls were seen but I did see one of the resident Little Owls. Just before the light went it popped out of my nest box and into the tree, I managed just the one distant image (below) at an ISO of 6400, it shows the nest tree, my nest box and the owl, I'll bet you a fiver you can't see it? I had two snippets of red hot information late today (Monday). 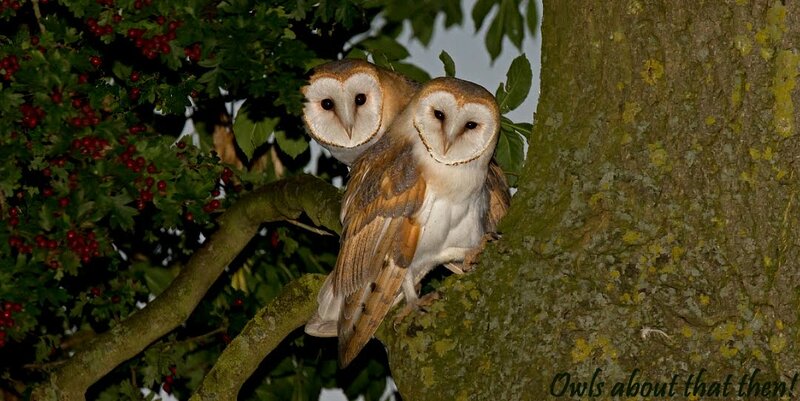 Firstly a birding buddy informed me that this evening he saw a pair of Barn Owls at a local site that I monitor, really good news as I have only ever seen a single owl here. And then a phone call from a local landowner, she has a Barn Owl roosting in one of her out buildings, and I have never ever seen a Barn Owl at that location before! Things are really starting to hot up on the Barnie front! Looks like you're in for an amazing start to the year Paul. A great post. Would love to be able to claim the fiver - but I reckon you're on a safe wicket there!! Unless it's that speck just to the right of the box? If anyone was going to pick it out in all those branches it would be you Richard! But sadly no fiver for you this time mate, you are a long way out!